Fitted with a louvre panel, 3 bins, tool tray and multiple accessory fixing points. L x W X H: 1250 x 1250 x 2200mm. Safety latch gate for safe entry. When performing overhead work, such as maintenance tasks, it is important to feel safe and confident, allowing the employee to do their job properly and efficiently. 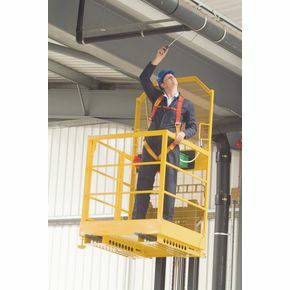 Our heavy duty access safety platform allows the user to feel secure and comfortable while performing overhead tasks. They work by being raised by a forklift truck and they are designed and manufactured to conform to Health and Safety guidance note PM28 and GN48 Standard. An anchorage safety harness secures the user, helping them to feel more confident while working and slip-resistant floors with drainage holes provides extra safety. Another great feature is the kick plate around the base which prevents tools from falling off the platform and causing a potential hazard. 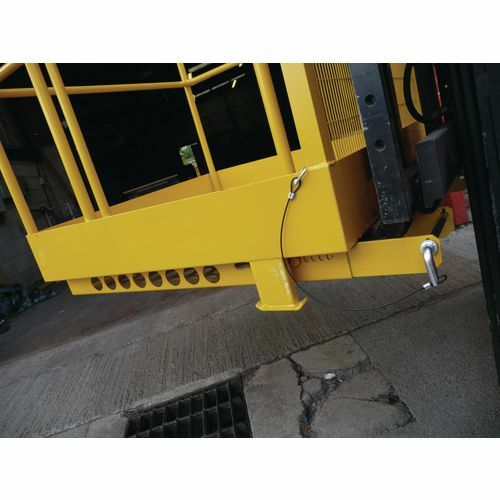 They are highly visible with a yellow paint finish and they are fitted with a louvre panel, 3 bins, tool tray and multiple accessory fixing points. There is also a safety latch gate for safe entry and it has a capacity of 2 persons up to a maximum combined weight of 300kg. 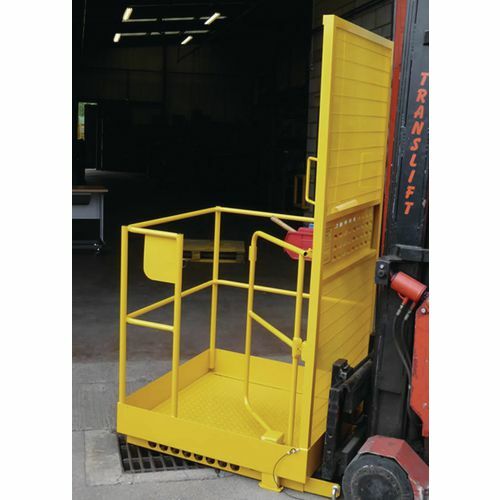 Our heavy duty access safety platforms are for overhead access and maintenance with safety. They come with a 12 month guarantee and FREE UK Delivery.